The independently released In The Beginning does a successful stylistic switch over to pastoral folk, country, and string/woodwind-backed meditative acoustic ballads, making for some of Griffen’s most beautiful moments. Steel guitar and harmonica set the rural mood on the opening ‘Don’t Give Up’, while ‘Amazing Carpenter’ skips along with a playful honky-tonk air. ‘Let Your Light Shine’ introduces some electric guitar for its lightly rocking style. Orchestration, when used, is tasteful and elegant, particularly on the ballads ‘Blessed Are You, Lord’ and ‘The Fisherman’. The gentle styles of Bob Ayala, Harry Chapin and John Denver are good reference points. (The Archivist by Ken Scott, 4th Edition). Oh, you are full of suprises. Thanks diakoneo. You are in my prayers. I am looking for piano music for this album, any ideas where I can find it? I know it existed at one time as I sang one of teh songs at my wedding. I have been looking for Ron Griffin for awhile and wondered what he is doing today. His music changed our lives and the meanings were poignant and right on. I have sung his songs and continue to. If it is possible, my husband and I would love to know what he is doing now. I have some of the guitar chords to some of his songs. child of the universe, follow me, and others. I had your records at one time. We bought them when they sang your songs at church. i have looked every where. i would like to buy a tape or two of your popular songs in the 70’s. I am 75 and would love to have them. thanking you in advance. “This day is filled with love, today is like no other day before and you and I will never be the same”….I have the original book – it was guitar only, if I remember correctly…..taught our school kids all these songs….they would recognize them in a minute….Don’t Give Up! I was one of the members of Ron Griffen and the Leaven. They were some of my most joyful, spiritual years of my life! As a young teenager when first joining the group I was awestruck at Ron’s talents. I believe as group we had some of the most beautiful harmonies and we really sounded great together. I too only have one book of the music which is from the album ” The Mustard Seed”. I would love to get copies of the other music we performed. If anyone knows where I might be able to find it please let everyone know. I have not has any contact with Ron in over 30 years. I heard he lives in Northern California somewhere and is now an Episcopalean minister. 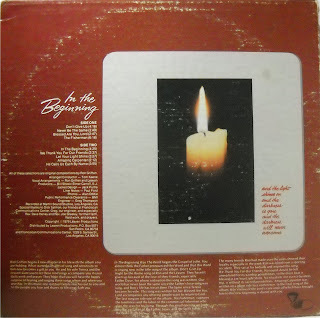 I had a tape of this album “In the Beginning” from years ago. I would love to be able to find the album or songs on the album to listen to. Thank you. Dr Ron Griffen has been our pastor at First United Methodist Church in El Centro, California for the past six years. We are blessed to hear his voice and guitar every Sunday along with his thought provoking sermons. I am the choir director at First United Methodist Church in Duluth, Minnesota. Thirty years ago, when I was confirmed in my home church, your piece “He Calls Us Each By Name” was played during our service. This year, as my first child becomes confirmed, I would like our praise band to learn and use that same piece during that service. Is there a place where I can find some sheet music/chord progressions, etc. for it? Thanks for any help, and thanks for your great music. I still have your album. I remember you from Our lady of refuge church in long beach, California. The album is now available at iTunes, etc. Ron Griffin sang at our wedding on Oct 4, 1980 and had the tape but I cannot locate it. Can you tell where I can find the music for this. Today is Filled with love is very special to me and want to have it played for my husband at our anniversary. Ron Griffin performed at hour wedding in 1980 and would like to play his music at our anniversary. Where can I get a copy of the music? Hi Ron, we played one Sunday at St. Catherine’s in Rialto. I was fellow guitarist with Cindy Nobel. I have kept your albums and still sing your songs. Thank you. I hope all is well. God bless.